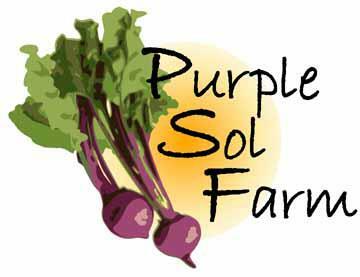 Purple Sol Farm was created in the winter of 2013 to deliver fresh, responsibly grown, and seasonal food to the greater Baltimore area. Purple Sol Farm strives daily to hold true to its mission: To cultivate a symbiotic relationship with local, regional, and global ecosystems. To engage and educate customers to make informed and responsible food decisions. To sell produce at an affordable rate while still maintaining a sustainable and profitable business. To embrace sound science and research to maximize yield quantity and quality. To maintain the grounds of the farm in such a way that it may serve as a haven of healthy lifestyle; wholesome eating; and personal development of the team, CSA members, volunteers, friends and family. Purple Sol Farm is a small scale, vegetable farm. This means we farm responsibly and consciously. While we are not currently pursuing an organic certification, we do grow to USDA organic standards. No harmful chemicals or pesticides are used on the produce. Insects and pests are managed using the Integrated Pest Management philosophy. Furthermore, no synthetic fertilizers are used. All of the soil nutrient requirements are met through composted food waste, aged farm animal manure or other, safe, non-toxic amendments sourced from responsible providers. The labor is performed entirely by myself or occasional volunteers. Best management practices are used to ensure no harm is done to the surrounding ecosystem and wildlife. Pollination occurs through insects naturally present in the area. All of the produce is hand washed for the sake of good food sanitation and to prevent any food borne illness. The products are stored and handled in clean facilities. Purple Sol also has some laying hens. They do whatever they want, whenever they want. They always have non-GMO feed and fresh water available. They are locked up at night to keep out predators. They lead pretty great lives. Thanks for reading! Send me an email if you have any questions!